Tiny Houses are a big success these days. Cutting back your possessions to the bare minimum and fitting your new life into a tiny house has become a dream for many. 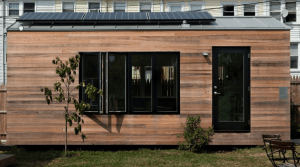 With tiny houses generally comes tiny electric use. But how can you make your electric bill as small as possible? Tiny Houses on Wheels (THOW) give you the added bonus of being able your life on the road. Where ever you are, you are already home. With this comes the question of how do I power this new found freedom? Solar power is the answer to both of these questions. Whether you are permanently attached to the electric grid, or travelling around with intermittent access to the grid, there are solutions available to add solar panels to your tiny house. 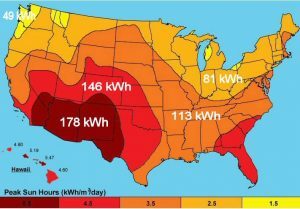 If your tiny house is in a permanent location that has access to the electric grid, and has a sunny spot available, grid-tied solar is the most affordable option for you. The solar panels can go on the roof, or if you prefer, out in the yard on a pole or ground mount. 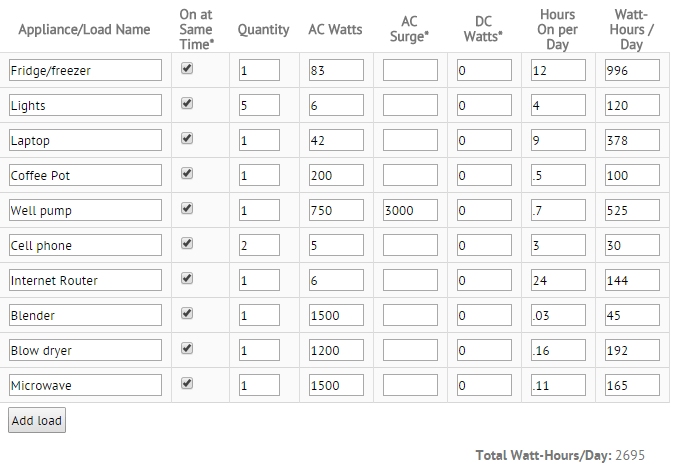 If you are already connected to the grid, figuring out how much solar you need is easy as can be. Simply look at your electric bill and see how many kWh (kilowatt hours) you buy from them. In this example, the house is using 200kWh a month. From here, you have a few simple options. 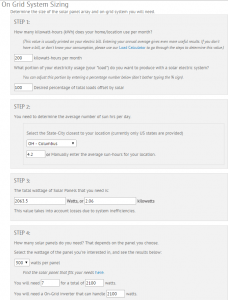 You can enter that 200kWh in a grid-tied calculator to see how much solar you need in your area. In the picture to the left, we selected Cleveland, Ohio as the location. To make 100% of our energy, we would need about 2000W, or 2kW, of solar panels. If we used 300W panels, seven solar panels would provide all of the power we need. 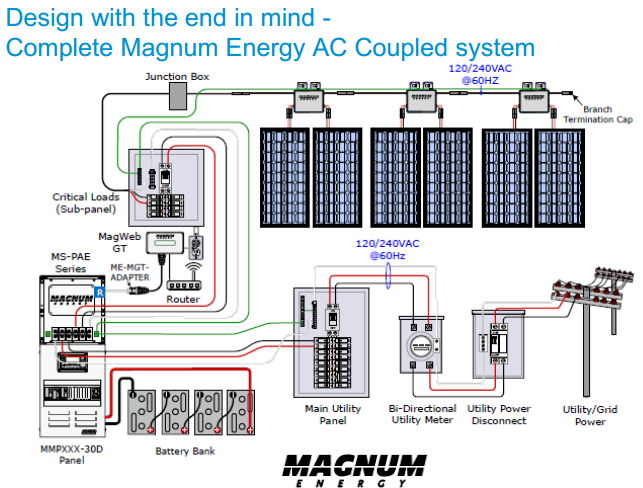 A grid-tied inverter would convert the DC power from the panels to AC power for your tiny house. You’d make solar electricity during the day, use what you need, and sell the rest back to the grid for your neighbors to use. Then at night, you simply buy the power back, same as usual. Your utility meter would spin backwards and forwards, depending on if you were selling or buying power. This is known as NetMetering. At the end of the month, you may have a credit to use in a less sunny month. A very nice advantage of grid-tied solar is that you don’t have to make all of your power with solar. If you don’t have the space or budget for seven solar panels, no problem, just install as many as you can. You’ll make less electricity with solar and have to buy more from the grid. But that’s no big deal, you still will have all the energy you need. 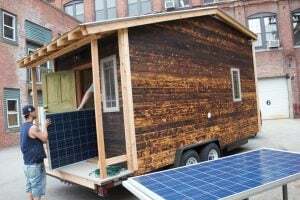 If your tiny house is on the move, or is in a remote location without access to the electric grid, or you just don’t want to depend on the grid for your power, an off-grid solar system is for you. With off-grid solar, you make all of your power during the day, and store it in batteries to use whenever you need it. If you are in an area that has a bad season for solar, like winter in Vermont, you will want to have a generator available to charge your batteries when needed. 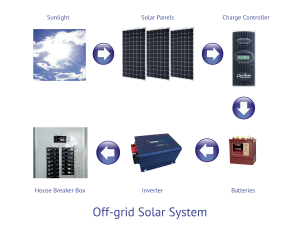 Many off-grid solar systems can actually connect to the grid if it is available, and charge up the battery bank if solar isn’t enough. But the big difference is that you don’t sell extra power back to the grid, you store it. This can be convenient if you are staying at an RV park during a stretch of bad weather. 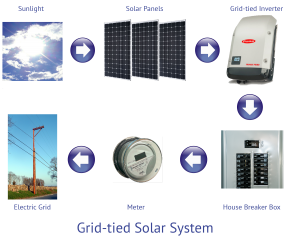 Sizing an off-grid solar system requires more due diligence than a grid-tied solar system. As we mentioned, if your grid-tied solar system is too small for all of your loads, you just buy what you need from the grid. With off-grid, you are on your own. If you didn’t make enough electricity during the day, you may have to postpone vacuuming your rug until the next sunny day. Monthly energy generation from 1800W Tiny House Kit. 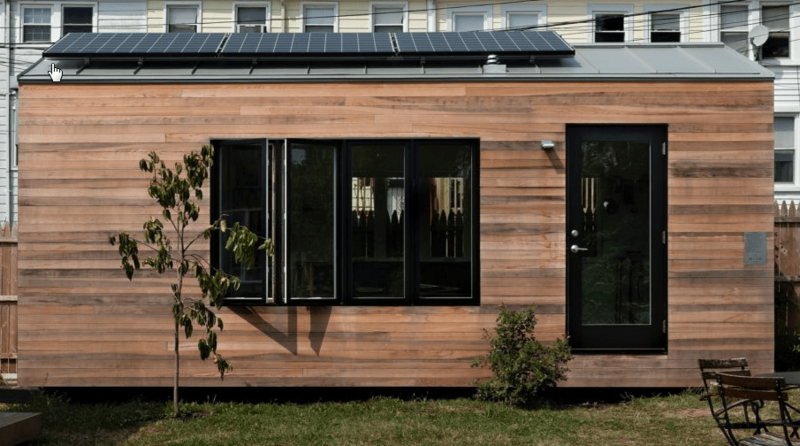 So how big of a solar system do you need for your tiny house? That all depends on the loads. If you are cooling the house with a ceiling fan, it will need a heck of a lot smaller system than if you are using air conditioning. Likewise with heating with a wood stove versus an electric heater. It also depends on where you are. A system in the southwest will often generate twice as much energy annually than in the northeast. If you aren’t already on the grid and able to check your energy use by looking at your power bill, the first step is to create a loads list. This will list out everything you’ll be powering; how many watts it draws and for how many hours a day. Below is an example of some common household items, and how much energy they can use a day. Actual mileage may vary, so take some time to create a loads list using our online calculator to get an accurate number. That will get you your daily energy used. Multiply it by 30 to get your monthly use. Ensuring that you use very efficient appliances will also help you minimize the size solar system you need. EnergyStar’s website can give you the annual use of rated appliances, divide by 12 to get monthly use. The most accurate way to know how much energy your appliances are using is to actually measure the use with a Kill A Watt meter. It measures the Wh used over a period of time, giving you precisely the information yo need to properly size your solar system. Let’s go back to that house in Columbus, OH. We’ve now decided to take it off-grid. If I use the 1800W Tiny House Kit, I can potentially generate 81kWh a month with it. That’s 2,700Wh a day. So what will that power? Quite a bit, as long as I’m only using what I need and not wasting any power. As you can see, I don’t have an air conditioner or electric heater in the list, that would use too much power for this system. But I can live quite comfortably in my tiny house, with all of the essentials. If you need a bigger off-grid system than these, don’t fret, there’s larger off-grid home solar power systems available. All of the solar panels likely won’t fit on your tiny roof, but if you have some sunny space in your yard, a ground mounted or pole mounted solar system may be the perfect solution. Take a look at our friend’s tiny house in Maine. We walk through the house itself and explain the basics of its off-grid solar system. If you have questions or need help picking which solar system is right for you, visit our website, give us a call at 877-878-4060, or fill out our questionnaire for help. I have 2 independent solar energy systems. an old 26 panels 12v. 60w. , 2 Trace C-60 charge controllers, 10 Trojan T-105 batteries and a Trace SW2512 inverter. A new one connected to the grid consisting of 12 REC 240 w. panels with enphase M-215 microinverters. How can I connect the battery system to power the new one when the grid goes down? So while it may be possible, please use extreme caution with the old equipment. I just found your site on Reddit. I live on grid north of Los Angeles. However my new 5 acre farm project is off-grid in Cabazon, Ca. ( 92230 ) it’s before Palm Springs off I-10. My zoning laws allow a 40 foot cargo container , no permit required. Being near the Los Angeles harbor made it easy to purchase and have delivered a brand new container. Now I am faced with powering up my new 40 footer. Power is at the curb but I have no interest in connecting to the grid. This is a lot of fun figuring out what kind of PV system to install. The more I research, the more time I am taking. I have a water meter and lots of sunshine. Also I am a ski bum all winter long. Great year, wasnt it ? If you are in the LA area let me know and I will show you the project. Hi Amy, been following AltE for quite awhile. Saw your post on Tiny House Talk. I loved the Aquion Batts but they went belly up so they be gone. My next favorite is Powerwall 2, didn’t care for the first one but now they have something workable. I am planning on one and possibly expanding to 2 now that you can do that with them. I am designing a 32-34 foot Tiny that will not be to tiny. I am tasking 2-4 feet of the space to solar control and storage. I will explain. If you are familiar with the Tumbleweed Cypress that was the start of my design. The solar portion I mentioned will be next to the tongue on the trailer, that is my utility area. So now we are at 30 feet for living space. I have a 6×8 bathroom on the far end with steam shower and washer dryer and compost toilet. Then a 8×12 Kitchen with full stove, full fridge, and naturally a fisher/paykel tall drawer dishwasher sink will be a 60/40 copper farmhouse sink. Then off to the living room that will be 8×12 for traveling and when expanded it will be 12×16 with theater and stereo and sofa sleeper and folding dining table entry will be hear thru side. next deck is the loft 8×18 expanding up to 7 foot clearance when parked and has exit to deck on top of living room 8×12. The house will be fully automated with computer controlled air conditioning and heat, may have radiant floor heat also in bedroom and first floor. The computer will have full control of door and window locks, window visibility control. clear and opaque for privacy. Cameras inside and out for security and in contact with me at all times. Computer will also have vacuum control to send the vacuums out to clean the floor every day or park for charging. Will be able to fight a fire, call fire department, police department as needed. (911). It will also be able to turn on and off power to the different equipment with fridge and computers having the highest priority. Want 6 solar panels on divided on each side of roof. and two on each expanding roof panel. The solar stroage will have 10-12 more that can be put out to catch the rays when we are parked and movable for best sun exposure. roof mounted panels I want to have position control for best exposure by the computer. I will talk with you about that when I have more information. Sound like a lot? I hope so. This is a giant luxury tiny at 576 sq ft of living space plus the computer/solar storage. will have powerwall mounted on storage above tongue and minisplit ac will be below. well there is some ideas. I am researching Appliances and slowly picking out the appliances. When they are known then I will have total knowledge for solar requirements. Want to talk to you about the solar part for tinys especially the panel mounting that I want to have designed for tinys. Hi Tom. Thanks for the shout out on Tiny House Talk. I asked Adam to reach out to you to help out with your incredibly cool project. I’m looking forward to seeing more about it as it moves along.